From pool to parking – the UN-recreational project! 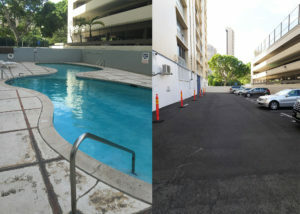 Atkinson Towers pool to parking project completed by IPR Hawaii. We’ve earned a reputation as a leading recreational construction company here in Hawaii over the past 20 years. However, there’s more to us than just parks, sports & play! Our project with Atkinson Towers is a great example of how we can help with your UN-recreational needs! With limited space to build here on Oahu it’s only natural that everyone is focused on ways to make the most of the space they have. Although a swimming pool sounds like an essential luxury for any condo owner, the reality is that they are an added expense to maintain and for many condo owners, they go completely unused. However, most of us use our cars multiple times in a day and space to park them is scarce throughout the city. Even with parking for every unit, households generally have two cars per family causing dilemmas for residents who need a place to park their second set of wheels. Atkinson Towers came to us with a request to help them find a practical solution to solve their need for more space to park resident vehicles – the UN-recreation project. We were able to convert their unused swimming pool recreation area into a brand new set of parking stalls, cutting their pool maintenance fees and creating much needed space for their cars and a building full of happy home owners! Need help with an UN-recreation project in your community? Don’t hesitate to CONTACT US, we’ll be happy to help you find creative solutions for your limited space!